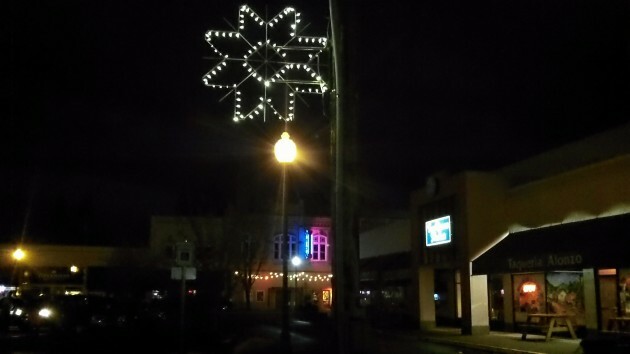 A bright star above the Two Rivers parking lot this week. 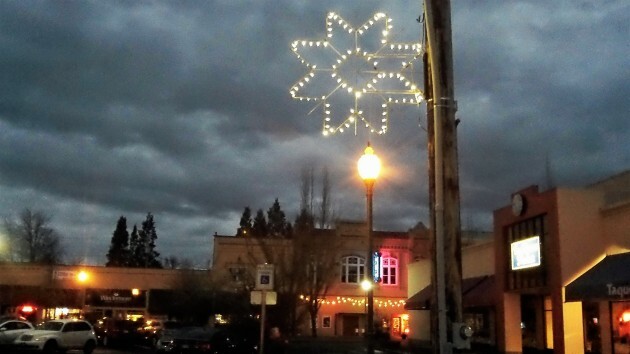 The stars have been a traditional holiday decoration downtown for maybe 20 years or more. So I wondered what was going on when I got back from a couple of weeks away and noticed them still up and still lighted on Tuesday. Wednesday I got a chance to ask the Downtown Association’s Peggy Burris about this. The group decided to keep the stars lighted a bit longer this year, she told me. Strictly speaking, they’re not shaped like traditional Christmas stars anyway (even less like snowflakes, which we mistakenly called them at the paper for some years after they were new). So there’s no reason they can’t brighten up the nighttime scene at times other than right around Christmas. And half an hour later, it looks even brighter.